Quick overview Packed with insightful, easy-to-follow tips and featuring a refreshingly diverse range of work from contemporary artists, 365 Hints & Tips for Drawing & Sketching is a comprehensive, highly accessible guide that is guaranteed to appeal to aspiring artists of all levels. Packed with insightful, easy-to-follow tips and featuring a refreshingly diverse range of work from contemporary artists, 365 Hints & Tips for Drawing & Sketching is a comprehensive, highly accessible guide that is guaranteed to appeal to aspiring artists of all levels. Based on 'a tip a day' being one of the most effective ways for artists to tackle new techniques and approaches, the book's clear, straightforward advice helps beginners to gain in confidence as they build their skills. 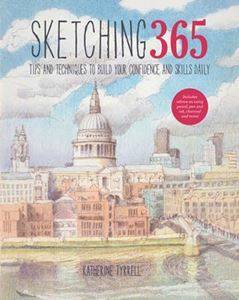 A far cry from other dry, run-of-the-mill art instruction books, 365 Hints & Tips for Drawing & Sketching uses concise, easy-to-follow text to engage readers and guide them through each different technique, covering everything from how to hold a pencil to how to achieve depth and balance composition, as well as tips for tackling specific subjects such as how to draw people or landscapes. Handy cross-references are also peppered across every page, helping to direct readers toward other relevant tips elsewhere in the book. Throughout the book, tips and advice are accompanied by artwork from a range of exciting contemporary artists, showcasing a wide variety of different media-including pencils, pen and ink, and charcoal-and inspiring readers to try and achieve similar results for themselves.